Grace is an elusive word for me. It's the middle name of my second daughter and it's a concept sitting far beyond my grasp. As much as I'd like to relish in what the dictionary defines as "free and unmerited favor"; I don't. Instead I find myself wrapped in rules and assumptions while running feverishly in the direction I hope is best with my measuring stick in hand adding up successes and failures. It can't be earned. It can't be won. It doesn't rest in the confines of any box. The idea of grace is foreign to those of us living in the land of comparison. Cannot be measured? What kind of crazy talk is this? How would you know you're succeeding or failing? You don't. Grace is the utter acceptance of it all, the absence of assumptions and the open arms of believing the best. 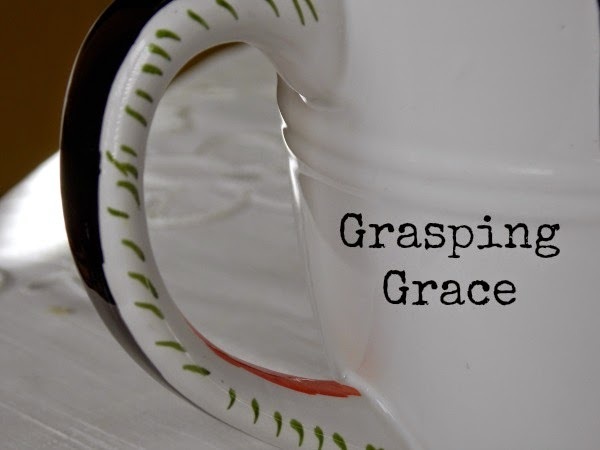 What if we had grace for ourselves? What if we lived our daily life not measuring ourselves against others or our own expectations? What if we took ourselves as we are, pouring out free and unmerited favor? What if we did that for others? I imagine the world would look a lot more compassionate if we did. As a Christian, I believe that grace is God's measuring stick. As much as I would like to "measure up," I can't. If God gives me that gift, I know I should be able to have grace for myself and for everyone around me. Of course, that's not always easy. Which is one reason why I need God's grace in the first place! I love this, "grace is God's measuring stick" ~ beautiful thoughts, Rebecca. Have you ever read any of Brennan Manning's books? If we had grace for ourselves my thought is that there would be less brokenness in the world...if we lived with out expectations we would be living free...yes so much compassion and love...great big divine love would explode across the earth...a revolution would take place...it would be amazing! Yes, yes, and yes! That's a fantastic picture of it, Cat.